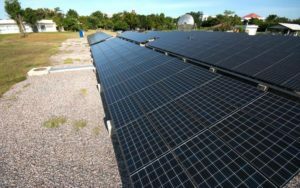 Thai company B.Grimm Power PCL (SET:BGRIM) has launched commercial operations at seven solar photovoltaic (PV) parks at home with a combined capacity of 30.83 MW. Four of the plants, with capacities of 5 MW each, are supplying power to the Metropolitan Electricity Authority under a 25-year power purchase agreement (PPA), B. Grimm said in a bourse filing last week. Those are facilities co-developed with state agencies and agricultural cooperatives under the War Veterans Organization of Thailand (WVO). They are located in Bangkok districts, Samut Prakan and Nonthaburi provinces. Separately, the unit of B.Grimm Group has brought online three additional solar farms in Phetchabun, Chachoengsao and Surat Thani. It collaborated on a 2.25-MW project with the The Chon Daen agricultural cooperative and on a 5-MW scheme with The Ban Na Doem agricultural cooperative. Its partner in the 3.58-MW project in Chachoengsao was WVO, through the Veteran Support Office of Chonburi. The 10.83 MW of plants are now deliverying electricity to Thailand’s Provincial Electricity Authority.